From deep within the gloomy catacombs underneath the bustling streets of Italy, ABYSMAL GRIEF return to wreak havoc upon the senses with their own unique brand of Blackened Doom Metal. 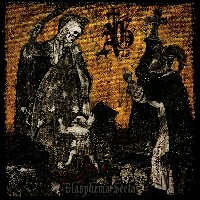 "Blasphema Secta" is the fifth entry in their illustrious career, and this one does not disappoint. From the moment the intro takes hold, one is transported into a seething underworld of demonic insanity, seemingly never to return. Let the ride begin! The haunting strings from the intro carry over into the second track, "Behold The Corpse Revived", perfectly. This song is a raging inferno that is accompanied by vocals that can only be described as whispers from beyond the grave. The droning bass and guitars barrel along over the slamming drums, and the strings (along with other assorted ethereal synths) lay over it all like a delicate, rotting shroud, so thin that it reveals all that is underneath. The song is very powerful and complex, maintaining its aura of doom and gloom throughout. Twisted, haunting chants echo in the darkness to begin track three, "Maleficence", which is reminiscent of earlier TYPE-O NEGATIVE material. This is a pretty incredible piece of music, and its thunderous assault will keep your head banging throughout its duration. Equally eerie and discomforting, the next song, "Witchlord", is an epic mixture of Stoner Sludge and Funeral Doom that exhibits some serious pit potential. The vocals are squeezed out from the throats of the dead, swirling atop a ghostly church organ that coats the song in a sense of dread and terror. With its many tempo changes and compelling chorus (which is sung by a female), "Witchlord" becomes quickly recognizable as an anthem of sorts, and is definitely the shining star on this record, in my humble opinion. The album closes out with an interlude entitled "When Darkness Prevails". Singing apparitions haunt the song while strange whispers and fluctuating synths build and fade into the distance. It is the perfect precursor to the album's final track, "Ruthless Profaners", whose opening riffs would please the average OBITUARY fan. The song is an absolute treasure, with vocals similar to En Esch of KMFDM, and the music backs it up wonderfully as if it were a Heavy Metal carnival in Hell. All in all, we have a pretty spectacular Doom album here that never strays from the darkness, and that is something in itself. ABYSMAL GRIEF doesn't candy coat anything here; this record is genuinely the shadows that block out the light. A phenomenal musical achievement!